We all know the difficulties involved in achieving great results. The pathway to success is always lined with potholes, hurdles, debris and a host of obstacles designed to stop us in our tracks. All too often, those barriers convince us to turn around and go back. Each time we do this we say goodbye to a dream and kill off a small piece of our spirit. Sadly, for some of us, several such U-turns convince us to never again set foot on that pathway. Over my many years of working as a coach, I’ve had the extraordinary honour of working with a few people who exemplify the above quote with everything they do. For years I wrestled with trying to understand what it was that separated those few from the vast majority of us. I realized that the main difference is that truly successful people have truly different habits. Simple, but not so simple to emulate. One habit those few have that propels them to stratospheric heights? They always finish what they start. They persist until they succeed, even when the odds seem to be impossibly stacked against them. They become absolutely obsessed with achieving their goals. They immerse themselves in every facet of the goal and become fanatical in their approach to reaching it. They too encounter the potholes, hurdles, debris and other barriers the rest of us experience, but where they differ is they view these obstacles merely as annoying, not fatal. The good news for us is within each of us resides the same seeds of greatness. Any one of us can learn the power of persistence. Once we learn how to harness the energy within us, we too become super achievers. There is, however, an irony involved in getting there. It requires tremendous persistence to develop, and then adopt the power of persistence into our very being. It requires effort and determination, obsession and emotion to become the type of person who will always finish what they start. It’s almost like you need to already have the quality in order to develop the quality. That’s why enlisting a coach or joining a program to assist you on your journey is so helpful. Not all who begin this journey will complete it. Some will search for, and then find, a reason to turn back. Others will simply convince themselves that the price of the journey is not worth the reward at the end. But, as Calvin Coolidge says above, nothing takes the place of persistence. 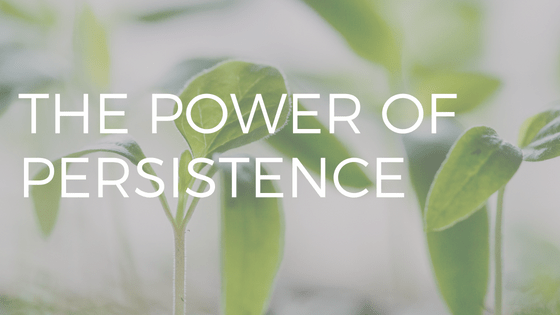 It is omnipotent, and I believe the journey to acquiring persistence has no cost. The real cost is to live a life without it. I am forever indebted to the wonderful clients I have had, and from whom I have gained so much knowledge. It is through working with so many remarkable people that I have learned how to help others gain the gift of persistence and to reap the rewards of obsession and immersion. Rather than shy away from promoting how they made their way to success, I want to share my program with as many people as possible. I am extremely proud to have played a small role in helping numerous others gain huge success in their lives.